It can be used in newborn foals who are in respiratory arrest or are having difficulty breathing. It is invaluable at clearing the respiratory tract of newborn foals & pumping air into their struggling lungs. It is easy to use, with only one person needed to operate it. It has been developed, tested & proven worldwide for over 19 years, so you know that it is a quality product. The pumps & masks come with a 2-year replacement warranty. Warnings- Please ensure you read the instructions thoroughly at least one month before your mare is due to foal, so you are prepared to use the kit as needed. Oxygen source is not provided. 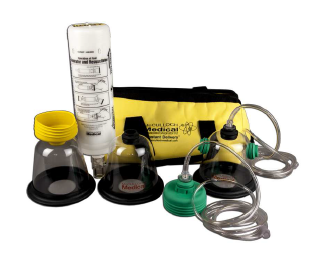 Please beware of unscrupulous retailers selling the Calf Aspirator/Resuscitator Kit, as a Calf/Foal Aspirator/Resuscitator Kit, this is misleading! This product is designed specifically for foals & also has the ability to supplement with Oxygen & the other kit is specifically for calves, so make sure you only purchase the foal kit.